It looks bad, I know – I announce with much pomp and circumstance my return to the blogosphere, and then take over a month to produce another post. I can only offer a thousand humble apologies, and explain that first, I was starting a new job, and then I came up against the monopolistic evil of internet provision in London and was cut off for the better part of a month, refusing to shell out for WiFi use in order to disseminate my Marxist-feminist dialectic from the hipster bars of Shoreditch. The reconnection of my internet did, however, happily coincide with the advent of plenty of material for a new and angry post. This was provided in part by the return to the nation’s screens of the costumed soap opera/SVU mash-up Ripper Street, and in part by a conference on the topic organised as part of Birkbeck’s series of lectures and film showings as counterpart to the Victoriana exhibition at the Guildhall Art Gallery. I won’t lie – I am as much of an omnibus and crinoline geek as the next Victorian Studies graduate, and can’t help loving the research and creativity that goes into the steampunk genre. ‘Victoriana: The art of revival’ is a gorgeous exhibition and I got childishly excited about dressing up for the neo-Victorian ball in the gallery crypt. Nevertheless, as the (for that evening) consumptive factory worker who authors the Marxism, Desire, Ontology blog pointed out, steampunk, and the entirety of historical fiction as a genre, is inherently reactionary. Like fantasy and science fiction, which offer, through their world-building possibilities, tremendous scope for subversion and breaking down of dominant discourses but practically always end up reinforcing precisely those discourses and presenting them as inevitable and ‘natural’, it thrives on titillation through the depiction of highly problematic ideas and actions without apology or contextualisation, the excuse being a nostalgia for an invented tradition in which political correctness had not yet been invented. These were the questions I had hoped to hear addressed at the conference on ‘re-writing the Victorians for TV and radio’. Unfortunately, the conclusion that Ripper Street used its historical setting to present itself as educational whilst incorporating cheap thrills appealing to its viewers’ latent brutality, and the acknowledgment of its frankly appalling gender, race and disability politics, were only stated outright at the very end of the afternoon, when time constraints no longer allowed for a fruitful (or even merely satisfyingly angry) discussion. What did emerge from between the lines of the papers and discussion, however, was a point that I think gives us considerably more cause for concern than merely the threat of rubbish television. This was the model referred to as ‘austerity BBC’. The speaker, Dr Benjamin Poore, used this to explain the decline of the golden era of the BBC adaptation of canonical texts as mini-series: the new model, he made clear, was responsible for the format heralded by Lark Rise to Candleford, which used the source text only as a springboard for a long-running soap opera-style programme. 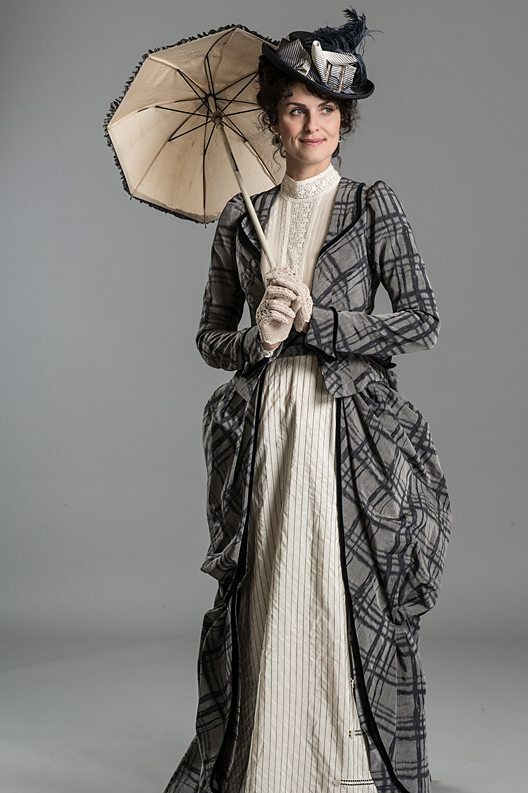 Since it requires only one custom-built set (and we find the BBC’s costume drama outfits regularly recycled) and has no fixed number of episodes, series on this model are cheaper to produce and have the potential to generate greater profits – as, for example, through the success of Downton Abbey. I would argue, however, that there is a more dangerous implication to the workings of this kind of ‘austerity TV’ which is inextricably linked to the reactionary aspects of historical fiction. The third episode in the new series of Ripper Street, nauseatingly entitled ‘Become Man’, confirmed me in this suspicion. Many of the conference-goers pointed out the conspicuous absence of people of ethnic minorities in the first series, and the appearance, out of nowhere, of a substantial Chinese community in the first episode of the second – which promptly proceeded to demonise this community as poisoning the West with its narcotics. A similar argument may be made about the treatment of characters with disabilities in the second episode, which cast these stereotyped characters as completely disconnected from the wider community. In the third episode, a band of hysterical women kidnap the opponent of London’s first female City Councillor. Of course, sensible Councillor Cobden takes resolute distance from these ‘extremists’ whilst playfully embracing the image of herself as a breathily willing object of love and lust; meanwhile, the madam and the women’s ringleader form a mutually abusive and voyeuristically eroticised bond for no reason other than their shared femininity (and implied hysteria). Besides these grating facts, however, it struck me as extremely relevant that these female terrorists were former employees of the Bryant and May Match Factory who were not satisfied by the outcome of the 1888 Matchwomen’s Strike. Following this summer’s Matchwomen’s Festival to commemorate the Strike, and coming in a climate of industrial disputes in a crisis acknowledged to affect women disproportionately, it is impossible not to see this as a deliberate provocation and an undermining of the uniting and unionising of – particularly female – workers. As I explored in my previous post in the context of modern-day recruitment techniques, the division of the workers along arbitrary lines of gender, race, disability, sexual orientation etc. etc. etc. is a well-worn capitalist tactic to undermine a united fightback. As in the Victorian period with the rise of its propagandist popular press, popular culture is a useful tool to spread these divisions in such a way as to make them seem embedded in ‘human nature’. Because of the reactionary nature of the genre, writers of historical fiction should always make extra efforts to guard against the uncritical adoption of modern-day stereotypes and prejudices in their pseudo-historical setting, but (and how consciously I cannot say with certainty) this brand of ‘austerity TV’ does precisely the opposite by cementing these stereotypes and prejudices – not because it is simply mindless and pretends to be no more, but in a setting that passes itself off as meticulously researched and educational, and thus does worse than excuse these attitudes. Last week, Saturday 8 June, marked the 100-year anniversary of the death of women’s suffrage activist Emily Wilding Davison, best known for her attempt to fix a suffragette banner to the King’s horse during the Epsom Derby on 4 June 1913. She fell under the horse and was trampled, and died of her injuries four days later. Although her action was censured by many, and she received piles of hate mail over the four days before her death, it received enormous publicity and support as well. Her funeral was organised and attended by leading members of the WSPU and drew great crowds; and her name appears in every GCSE history textbook that mentions the suffragettes. In the run-up to the centenary of her death, there has been a change in public perception of the suffragettes in general and Emily Davison in particular. In 2008, as one of my internal assessments for my International Baccalaureate, I focused an historical investigation on Davison’s contribution to the cause of votes for women, and, I’m ashamed to say, came to the predictable conclusion that, while popular depictions of Davison as hysterical and suicidal were unjust, her tragic death did little to convince the public in favour of female suffrage, which wasn’t won until women’s contribution to the WWI effort was recognised – and, equally predictably, this conclusion received top marks. In the last few years, however, there has been a tendency to recognise the activism of the suffragettes, at least to the extent that it finally lent urgency and publicity to a campaign that had been underway much longer than is generally known. As early as 1825, William Thompson and Anna Wheeler argued for women to be granted equal political rights; in the 1850s there was a vocal campaign to allow women to sit in Parliament; and many of the great female reformers of the mid- to late-Victorian period were in favour of some form of women’s suffrage. 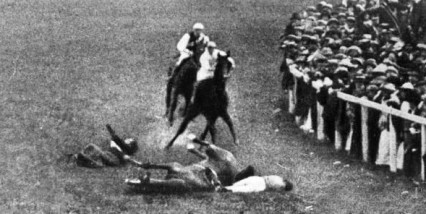 However, while Emily Davison is now recognised as a martyr to her cause and has been commemorated with various events this year including the placement of a plaque at the Epsom Racecourse, there is still a reluctance to take her or the other suffragettes entirely seriously. A campaign to hold a minute silence at this year’s Derby was dismissed as ‘logistically impossible’. A petition to erect a statue of her in Parliament, which points out that ‘Of the 100 non-royal statues in the Palace of Westminster only 6 are of women’, has got just over 300 signatures thus far. She may no longer be dismissed as suicidal, but the emphasis in the telling of Emily Davison’s story is still on her failure rather than her commitment to the idea of ‘deeds not words’ in a campaign that had been subject to polite and impolite dismissal for well over sixty years. I am concerned that this sense of dismissal still clings to the memory of the suffragettes, even now that the centenary of the 1913 Derby has helped to bring them back into the public consciousness. Modern-day depictions generally show them as disorganised and incompetent, whether as screaming harridans overcompensating for the boredom of their middle-class existence or dithering spinsters. And, whilst I acknowledge that the suffragette movement did have obvious class limitations and there was a great deal wrong with the politics of leaders such as Millicent Fawcett and Emmeline and Christabel Pankhurst, it is important to note that popular culture is much more inclined to emphasise this in a female-run campaign than in social and political reform movements led by men. 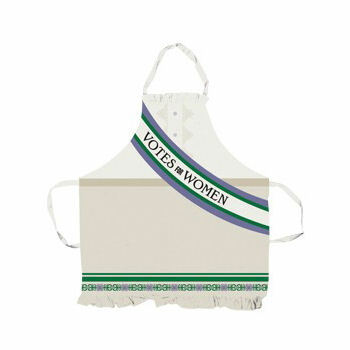 A ‘Votes for Women’ apron: proudly display the WSPU sash – in the privacy of your kitchen! Whilst men of reforming zeal are honoured in modern-day popular culture with must-watch biopics from Amazing Grace to Diarios de motocicleta, televised commemorations of women’s activism seem inclined to focus predominantly on the littleness and domesticity of their work. Thus, for instance, the strategic brilliance of the suffragette boycott of the 1911 census is represented only by one or two photographs in the Guardian’s ‘Census in Pictures’ feature. And, much as I love my new acquisition, a ‘Votes for Women’ tea towel from the British Library, the idea of printing the slogan on a tea towel is suggestive of a quirkily subversive domesticity that your dinner guests may remark on, in the protective atmosphere of your own kitchen. One example of this persistent notion is the new BBC comedy series Up the Women, the first series of which aired on 30 May. A second series has already been commissioned. Written and produced by women, with a predominantly female cast starring, among others, Judy Parfitt and Vicki Pepperdine, it has an interesting premise, looks lovely in terms of mise-en-scène, brings the suffrage movement back into the public consciousness in an accessible and entertaining way, and sounded like a great idea all round. I enjoyed watching it, but also made me increasingly uncomfortable. It is true that the characters in Up the Women are predominantly lower-middle and middle-middle class, but to them middle-class female social reformers such as Florence Nightingale, Emily Hobhouse and Josephine Butler, who had definite political affiliations, would have been held up as examples. Despite what the tableau in the third episode suggests, the Queen of Sheba and the Virgin Mary were not the only role models available to female activists in 1910. The characters, furthermore, are caricatured to an extent that cannot be explained or excused as merely ironic. Each ‘archetype’ of woman – the self-effacing spinster, the serial mother, the skilled social climber and her tempestuous young daughter and aged nymphomaniac mother, and even the self-educated organiser conquering her own insecurities to rally her sisters and break out of her enforced petty idleness – is out of touch and, at bottom, simply dim. And although the men are, if possible, even dimmer and weaker, and this is skilfully and hilariously used to discredit contemporary anti-suffrage arguments, one feels the fight for women’s suffrage should not be based on the fact that most women and men are as slow as each other. In the end, despite the popular revival of the suffragette image, the fact remains that while men, even (one would suggest most military and political strategists) those who bungled, get statues and biographies and dramatised biopics, revolutionary women receive hate mail and are depicted as hysterical for generations, only to be reclaimed with cake, sitcoms and tea towels. Living in the old East End, where nightly Ripper Tours flood the streets after dark, I can testify to the fact that the shadow of Jack the Ripper has continued to haunt the popular imagination well beyond the bounds of 1888 Whitechapel. And I don’t mind this, per se: despite all the wrong reasons for which he fascinates, there are also a few right reasons to be found, as demonstrated, for example, by Judith Walkowitz in her introduction to City of Dreadful Delight. Therefore, I was actually quite excited to discover Ripper Street: uniting my interest in the Victorian period and my not-always-entirely-guilty pleasure in detective series, it seemed to present quite an intelligent and original, though popular, take on the old concept. What the show definitely succeeded in doing was proving that a good first episode is enough to hook the viewer – or it hooked me, anyway. The premise of portraying a police force scarred by the events of the autumn of 1888, and a detective doing his utmost to prevent that panic from resurfacing with every similar (copycat?) case, was novel whilst making logical, political and psychological sense. There were just enough hints at backstory to fascinate, and some of the characters were really well chosen and drawn. However, this very interest in backstory soon got out of hand. Each of the characters had one – one filled with violence, crime and trauma. And while there was obviously a lot of all three around in late-Victorian London, some – or a great deal – of it seemed simply improbable. There could be some explanation for this, arguably, in Engels’s theory of characters and situations as ‘types’: the writers of the show were clearly very aware of the many different political and social issues besetting the East End in the late 1880s, and each episode and each character came to represent one or more. Thus, it made sense to include an episode on the 1889 Dockworkers’ Strike, and present the gun-slinging, semi-criminal, ex-Pinkerton Yankee pathologist’s experiences of the Chicago May Day massacre. Nevertheless, often this heightened awareness of historical context spilled over and became excessive, as with this very character’s false name, secret flight, unlikely residence in a brothel, and the vengeful posse pursuing him across the Atlantic. As the show reached the later episodes, the pressure to explain these various confused plot points increased, and resulted in the last two episodes desperately trying to build a story around the tying up of loose ends. But this wasn’t what made me uncomfortable. The reason I had a recurring sense that I should not be enjoying what I was watching was related to an apparent lack of a sense of the meaning of the historical context and detail as it related to the present day. Thus, for example, the dashing and incidentally murderous antics of the inspector and his sergeant, but particularly the pathologist, eliminated the need for the writers to deal with the problem of corrupt Victorian courts, hideous punishments and execution, but as a result portrayed a primitive and immediate justice of the kind that is so off-putting in some American police series. Although vigilantism is ostensibly judged in the script, often it seemed as though the historical setting served as an excuse to fantasise about a simplistic system of instant trial and retribution which, as a society, I had hoped we had outgrown. Another backstory issue that continually got in the way of my enjoyment was the Inspector’s relationship with his wife. The child mortality rate in Victorian London was staggering, so their being driven apart by their different ways of (not) coping with the death of their daughter made sense, as did their both throwing themselves headlong into their work. Emily’s choice of charity work was a logical one considering her class, background and education, and the clichéd addition of her attempt to replace the object of her nurturing. Even the Inspector’s double standard – he is allowed to work and rarely come home or speak to his wife about his grief, but expects her to be constantly emotionally available to him – is not unrealistic, particularly considering the lingering expectations of separate spheres. What stuck in my throat was the show’s way of supporting him in this unreasonable frame of mind by providing him with the nurturing, womanly, motherly ideal in the form of the matron of an orphanage. She, despite her awareness of his wife and her general good sense, unhesitatingly welcomes him into her bed. In terms of the backlash of post-feminism, a regime of cuts that are turning back the clock on women’s achievements and opportunities, and the Tory advocacy of Thatcherite Victorian values, this emphasis on the wife’s work outside the home, to benefit social outcasts, ruining the marriage of the pillar of society that is the Victorian police inspector, is a dangerous one. Although Ripper Street is an excellent police drama in terms of originality of premise, topics covered and suspense maintained, I was disappointed to see such a clever idea devolve into an unexpectedly simplistic rendition of the modern perception of ‘Victorian values’. On top of that, the choice of protagonist necessarily got on my nerves: as my friend remarked, Matthew Macfadyen really only has one face – and I will never forgive his having stuck that face on Mr Darcy in the 2005 adaptation of Pride and Prejudice.